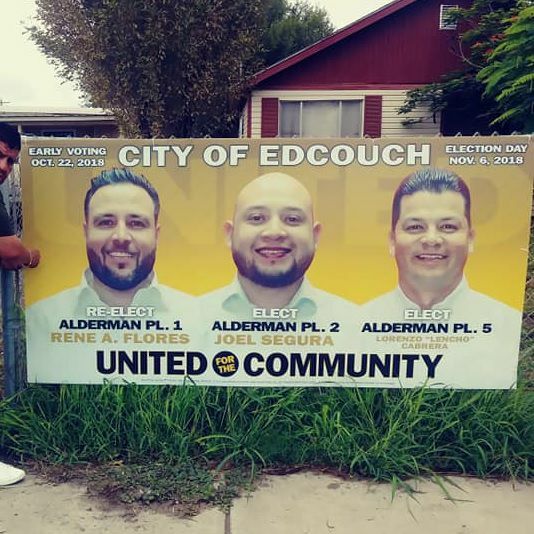 EDCOUCH — The elections administrator here wrote a strongly worded letter this month, accusing board of aldermen candidate Joel Segura of living outside city limits, in neighboring Elsa. Elections Administrator Pete De La Cruz informed Segura that he cannot become an alderman — if voters elect him in November — because the address on his application for a place on the ballot does not abide by the city’s requirement that he live in Edcouch. “I assume if that were your residence, you would have known” the address “does not exist within the city of Edcouch,” De La Cruz wrote in the letter sent to a post office box address and dated Oct. 1. Residency often emerges as an issue in city races, from last year’s mayoral races in Donna and Mission to a city commission race in Weslaco. The matters, at times, are resolved in court when a lawsuit is filed by the accused candidate. Attorney Orlando Jimenez, who Segura hired after the ineligibility accusations surfaced, remains confident that his client resides within city limits. Segura lives on Frederick Street, he said, with his aunt Alicia Peña and uncle Rosendo Peña. The city’s elections administrator, however, claims Segura does not live in Edcouch, a determination made two months after the candidate filed for the seat. “It’s a scare tactic to try to get him to back down,” Jimenez said. Complaints about Segura’s residency prompted the inquiry into his residency, according to the letter. He listed 108 N. Frederick St. in Edcouch on his ballot application in August. Hidalgo County Appraisal District records show the Peñas own the home at 108 Frederick St. in Edcouch. The letter also informed Segura that the accusations shouldn’t be taken lightly and the city could pursue a criminal case. Hidalgo County District Attorney Ricardo Rodriguez confirmed that his office had not been briefed on the matter as of Thursday afternoon. Segura was not registered to vote at 108 N. Frederick St. when he filed for candidacy, according to the letter. Segura registered to vote in the county in 2005, according to Texas Secretary of State records. His registration has been active at the Frederick Street location as of Oct. 1, the day the letter was sent, making it unclear when he submitted a change of address to the election’s department. The Monitor filed an open records request Thursday for Segura’s voter history and change of address forms with the Hidalgo County Elections Department. The election’s department has up to 10 business days to provide a response to the request. Jimenez called the move to disqualify Segura an “unfortunate and desperate attempt at intimidating” him, potentially as revenge. Last year, Segura ran alongside some currently in office but shifted slates this election cycle. He’s running on the “United for the Community” team with candidate Lorenzo “Lencho” Cabrera and current Alderman Rene A. Flores. Segura’s name will remain on the ballot. He seeks to unseat current Alderwoman Esmeralda Cabrera. Jimenez and Segura will hold a news conference Friday afternoon to disclose photos and other information to the media, an effort to assure residents that he lives in Edcouch. “The voters should have the opportunity to vote for who they want,” Jimenez said.